Cucumber kind of works with everything. There’s cucumber soup made with potatoes, cucumber and onions, cucumber and pork, cucumber and strawberries, cucumber and watermelon, on in this case nectarines and grapes. It has a mild, but fresh, flavor that complements nearly any flavor and its juicy composition helps it absorb flavors well making it a medium for marrying disparate flavors together. This was an experimental salad from start to finish. First I pulled a few leaves off a tarragon sprig and dipped them in plain low-fat yogurt to see if I liked yogurt and tarragon. Yum, yes I did. Well, that settled my approach for the dressing. I took one sprig, pulled the leaves and chopped them fine and added them to 3 TBSP of plain yogurt. I added just a sprinkle of salt because it will cut the bitter flavor that yogurt can sometimes have. I peeled half of an English cucumber, cut it in quarters lengthwise and sliced away the seeds. I snacked on them, so they were not wasted. I then chopped up the cucumber. I added one piece to the dressing to see if I liked it and I did, so I added the rest. Then I cut one nectarine into small chunks, testing one piece in a spoon with cucumber and dressing. Yum. I tossed in the rest of the nectarine. Next I took a spoonful of the salad in the making and put a red grape on the spoon with it and took another taste test and knew this was the perfect final touch. I tossed in about 1 cup of red seedless grapes, tossed all the ingredients together lightly and had a fresh, delicious salad for lunch. There is something about grapes and tarragon. It tastes as though you are eating wine. 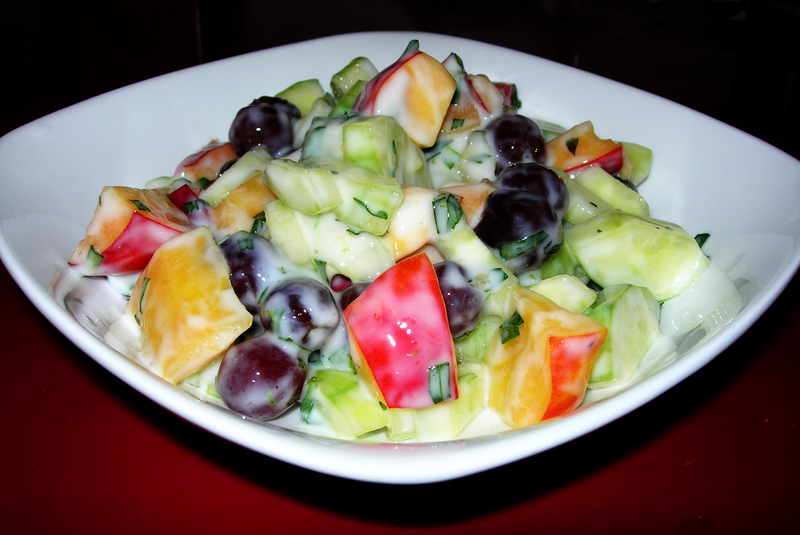 That fresh sweetness of the nectarines and the juicy spring flavor of cucumbers and with creamy yogurt. It was so good I wanted seconds. However, I only made one serving. This is made with a super simple fruit dressing that adds just a bit of depth to the sweetness of the fruit. I stirred 1/2 teaspoon of buckwheat honey into the juice of 1 fresh squeezed lemon. I heated it in the microwave just a bit to help it dissolve. Buckwheat honey is earthier and significantly less sweet that most honey. It has a malty flavor and is very thick and dark. After dissolving all the honey in the lemon juice, I added 1/3 tsp of sumac, a tart Middle Eastern spice that adds some pungency to the dressing. 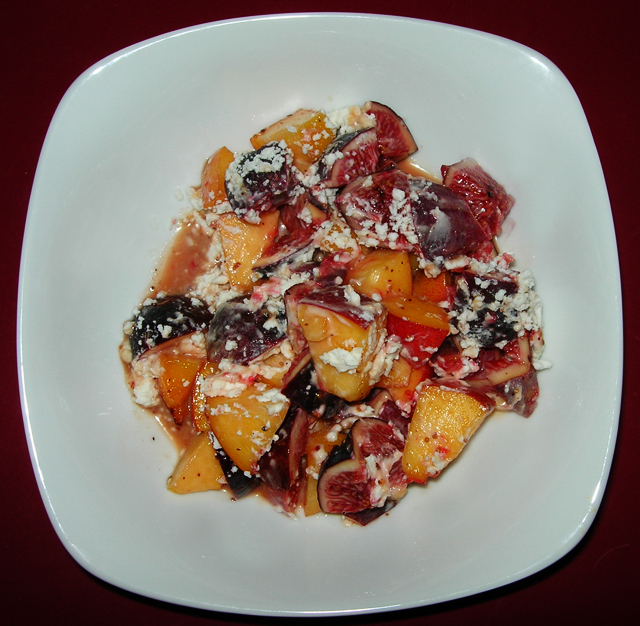 I then cut up some figs, half a nectarine and about 1 oz of chevre, mixed them together with the dressing and served. Out of this world! 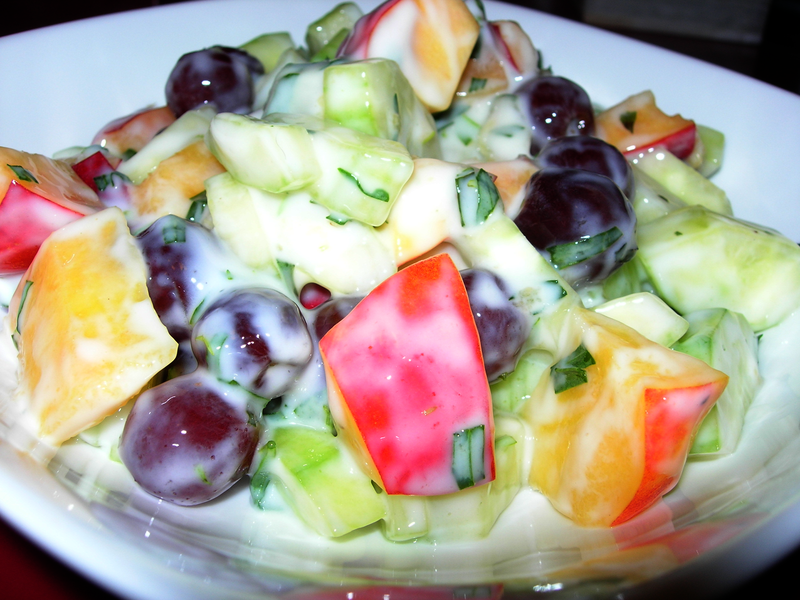 The fruit alone is delicious, with the cheese, it fabulous and with the cheese, fruit and dressing, it’s amazing. I had company over and tossed this together quickly. She liked it so much that she went home and made it for her husband who loved it as well. It’s a very easy recipe. I began by heating my skillet and adding just a touch of olive oil so that the pan was hot when I put the chops on. Cooking 6 minutes on one side, I turned it over to cook on the other. In another pan, I added 1/4 cup of white wine and about half that of water and tossed in about half of a finely chopped onion to braise in the wine sauce. Meanwhile I cleaned and cut up two nectarines and 4 figs. I did not peel the figs. I cut the figs in half and cut the nectarines so they were in chunks the same size as the figs. I tossed the fruit into the wine and let it simmer. I added salt, pepper and 2 tbsp of dijon mustard. I occasionally added a dash of water to keep it from burning while the fruit broke down. When it was done, I squeezed the juice of one lemon in it. Meanwhile, I chopped up a bit of lettuce, tossed on some red grapes and chevre cheese and dressed with a bit of balsamic vinegar and oil. 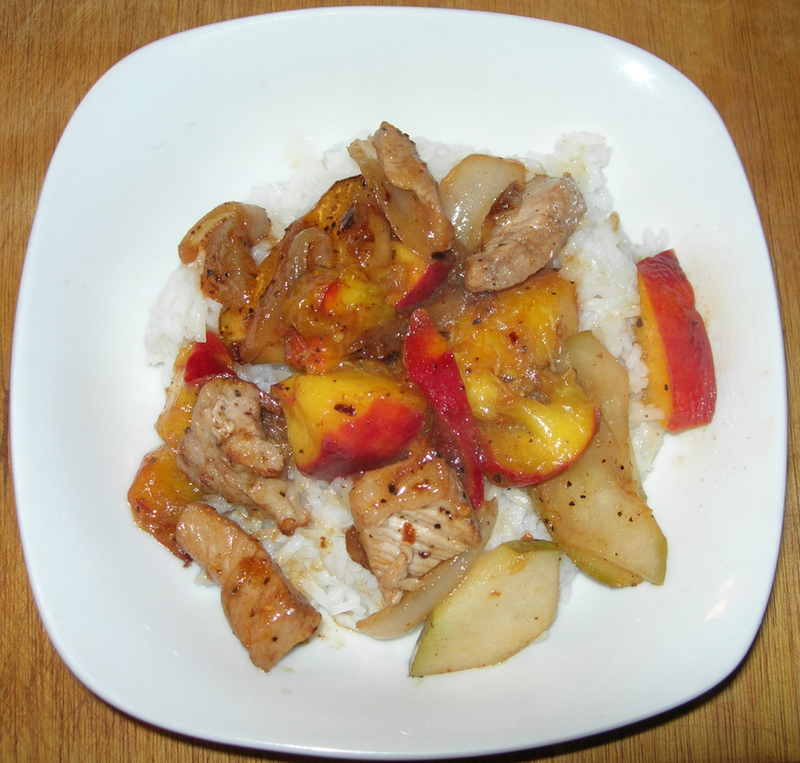 When the pork chops were done, I put them on the plate and served with a some of the nectarine-fig sauce. Saute the chicken breast in a small pan with 1/2 tbsp of olive oil, some salt and pepper. 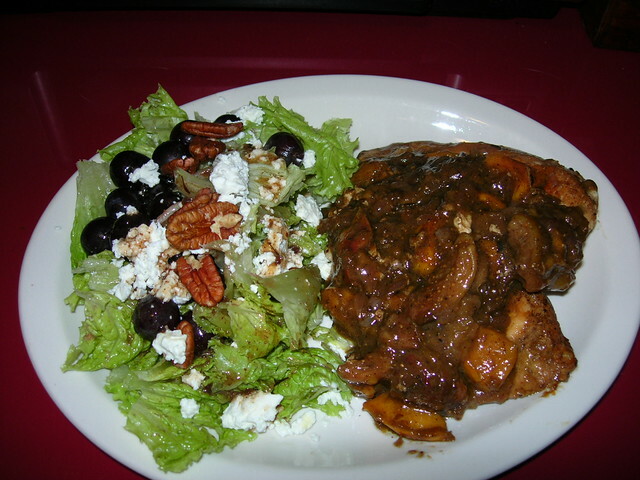 After it gets nicely browned on the outside, finish it by braising in Savory Cherry Sauce. I made this ahead and stored in the fridge. The vinaigrette is made from 2 pounds of cherries cooked with one finely sliced and diced onion, a cup of white win, 2 tsp of tarragon and 2 tsp of dry mustard cooked together nicely with just a bit of balsamic vinegar added at the end to taste. i used about 2 TBSP. 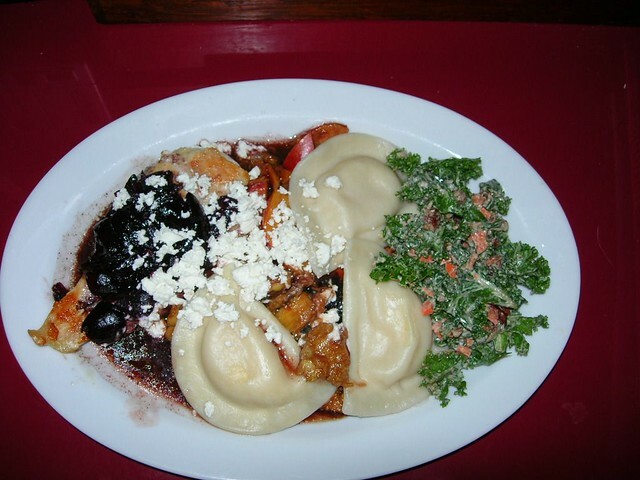 Meanwhile bring 1/2 water to a boil, add a bit of chicken stock (1/4 cup) and cook from frozen pre-made pierogies. While that’s cooking, you can make the nectarine-fig chutney. Finely chop 1/2 onion and saute until softened in 1 TBSP of olive oil. While it’s cooking, cut up two nectarines and 6 figs. Add to the onions and pour in a little white wine for them to cook in. Add salt and pepper and cook until they soften. Add 1 or 2 TBSP of Dijon Mustard (to taste). 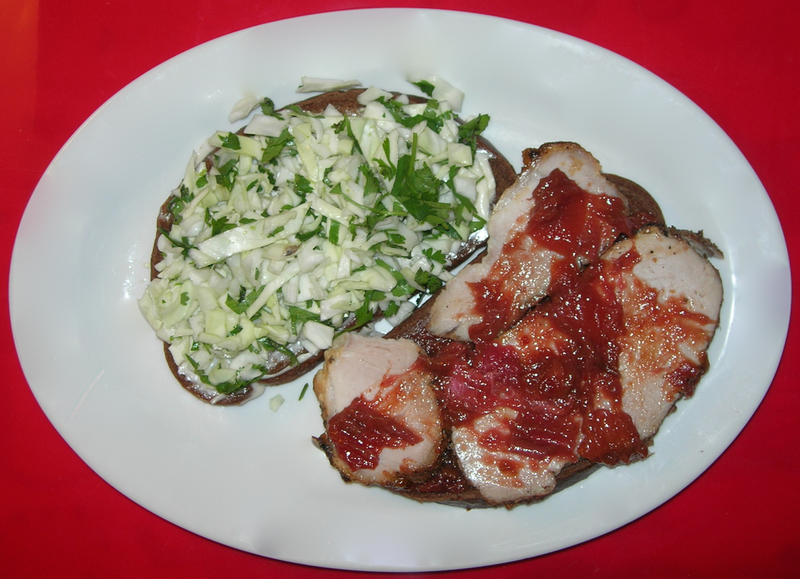 Works beautifully on pork, pierogies, chicken. 1 bunch of curly kale, stems removed and chopped into small pieces. and the salad dresssing. Mix the following together before adding to the above. The easiest and tastiest breakfast ever. 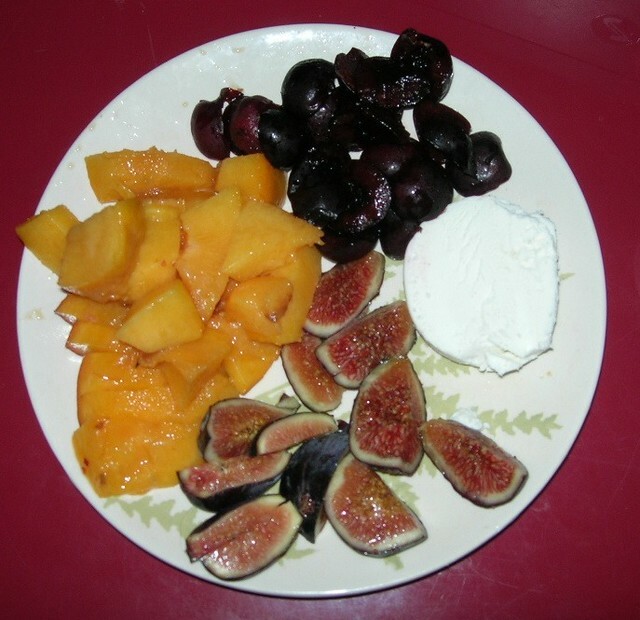 I cleaned the fruit, pitted the cherries, cut up a nectarine and four figs and served with 3 oz. of chevre.